For 30 years, bleach activators have been a key component in powder detergents providing versatile stain removal, improved whiteness, and removing tough odors. 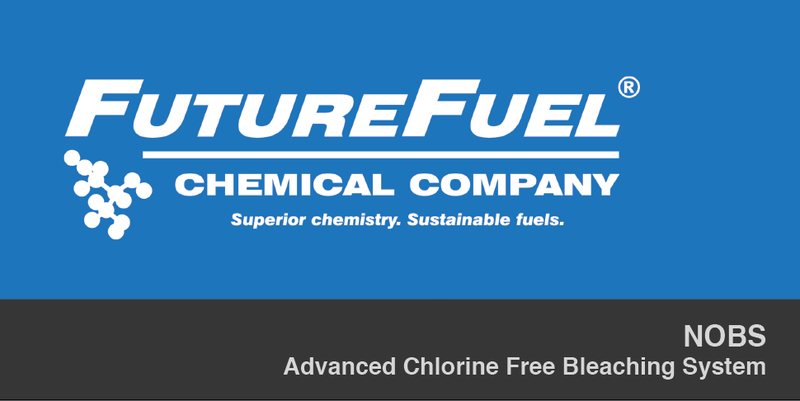 During that time, FutureFuel Chemical Company has been the sole manufacturer of NOBS, a leading bleach activator that performs in cold water. A bleach activator provides an alternative to harsh products, such as sodium hypochlorite, that contain chlorine. Chlorine-containing products are corrosive to washing machines and destructive to fabrics. Non-chlorinated products, such as sodium percarbonate, produce hydrogen peroxide as a whitening agent. These products are hot-water activated, which can increase energy costs, destroy fabrics and have a negative impact on the colorfastness of the fabric. 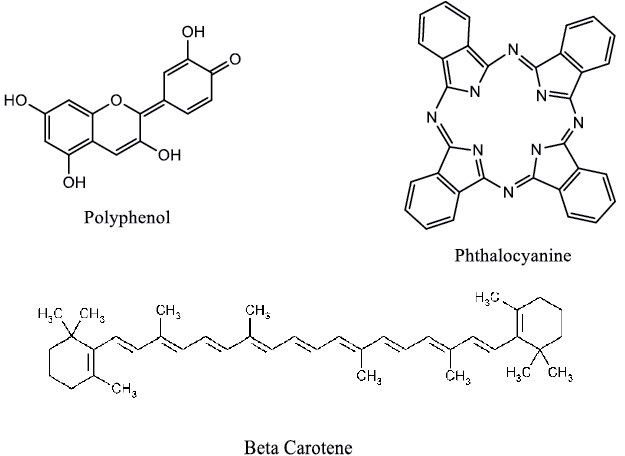 The colors in natural or synthetic dyes and stains are due to the presence of chemical compounds that absorb light. 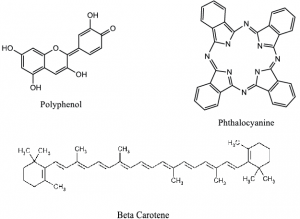 For example, polyphenols are responsible for the dark color of tea and coffee while carotenes are responsible for the red and orange colors of certain vegetables and vegetable-based sauces. Bleaching systems containing NOBS produce an active peracid bleach at low temperatures that have the ability to fight both water soluble (hydrophilic) and water insoluble (hydrophobic) stains. 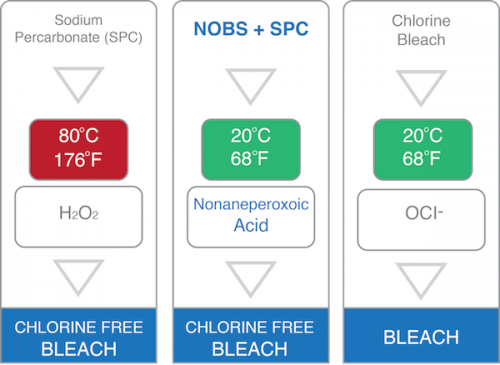 Chart I compares the percentage of available bleach of three bleaching systems versus time at 20 C. NOBS activates in cold water with sodium percarbonate, another component of the detergent, to produce an organic peroxide that is the active ingredient in the bleaching system. The chart demonstrates that after one minute, 100 percent of the bleach from the NOBS system is released. The chart also reveals that an alternative bleach activator, Tetraacetylethylenediamine (TAED), approaches 100 percent after 20 minutes at the same temperature. This is longer than the typical wash cycle. 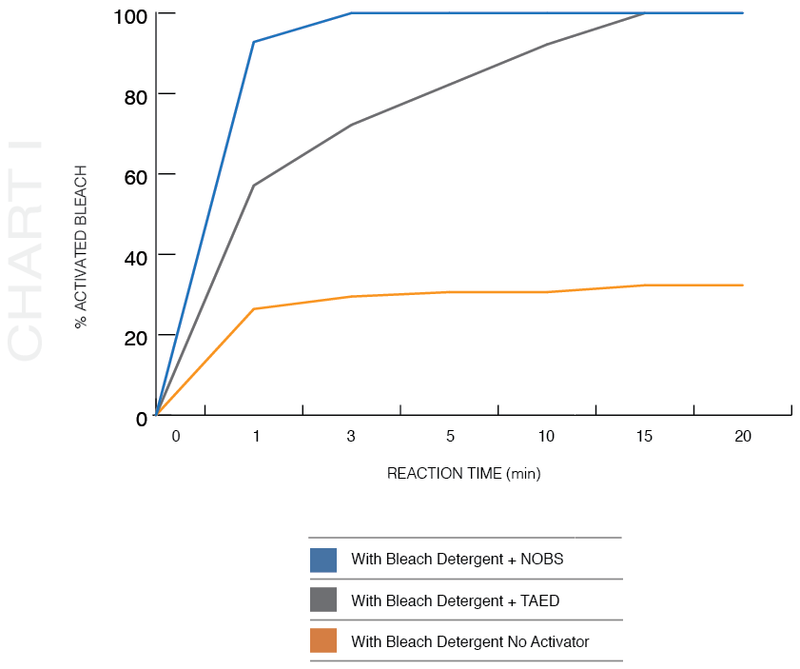 A bleach detergent with no activator only releases 30 percent of the available bleach. 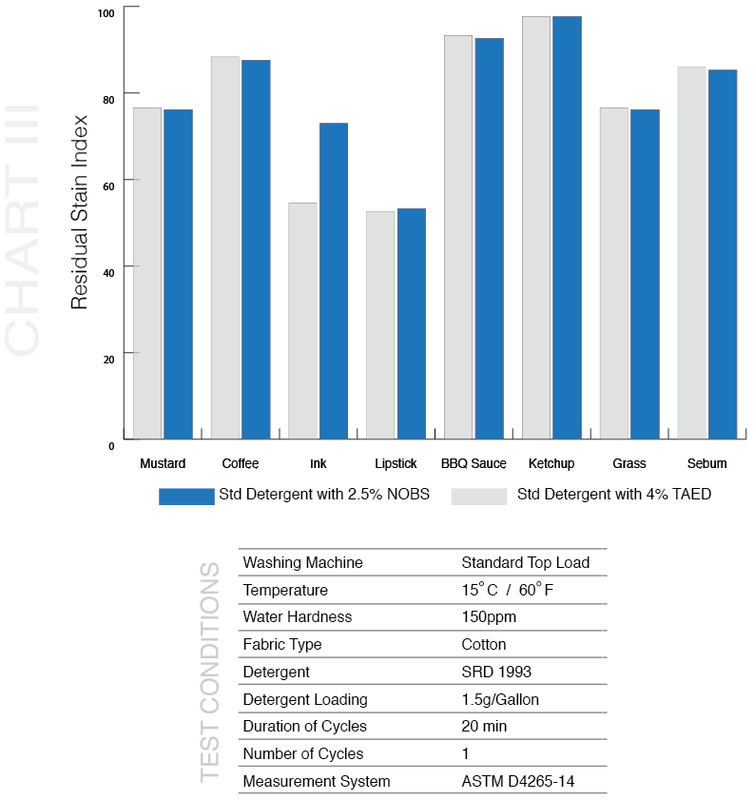 Chart II shows the performance of a leading brand of powder detergent that does not contain NOBS vs. the same leading brand powder detergent with 2.5 percent of NOBS added. When NOBS is activated with sodium percarbonate, the peracid nonaneperoxoic acid is generated. The long-chain peracid interacts with hydrophobic stains on the fabric in cold water and removes the stain. 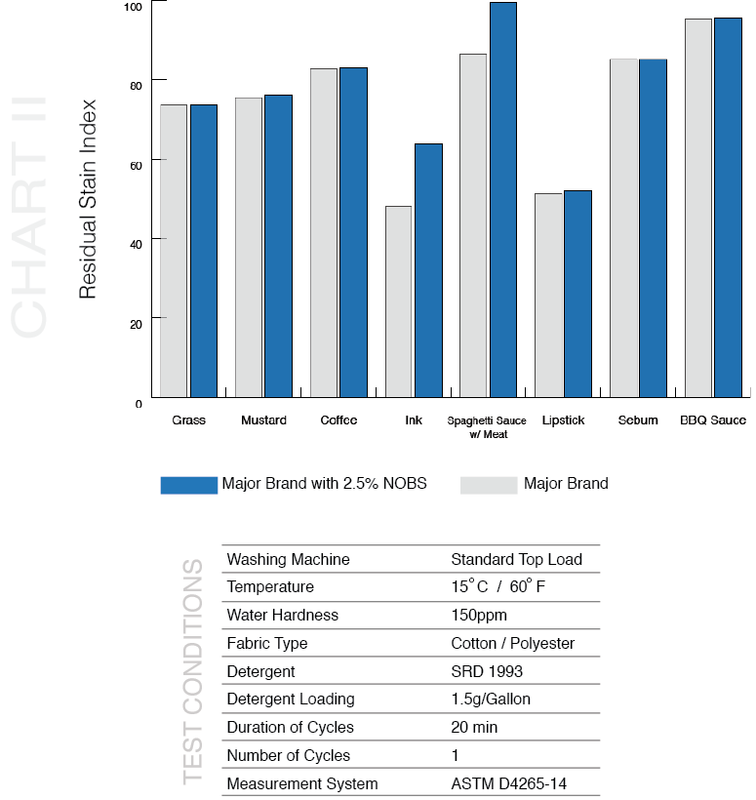 The data shows certain superior performance with the addition of NOBS for the hydrophobic stains tested. Chart III shows at lower concentration, NOBS essentially is equally or more effective than TAED on a select set of stains. The evaluation was performed on cotton fabric at 15 C / 60 F by adding NOBS or TAED to the standard detergent SRD 1993. 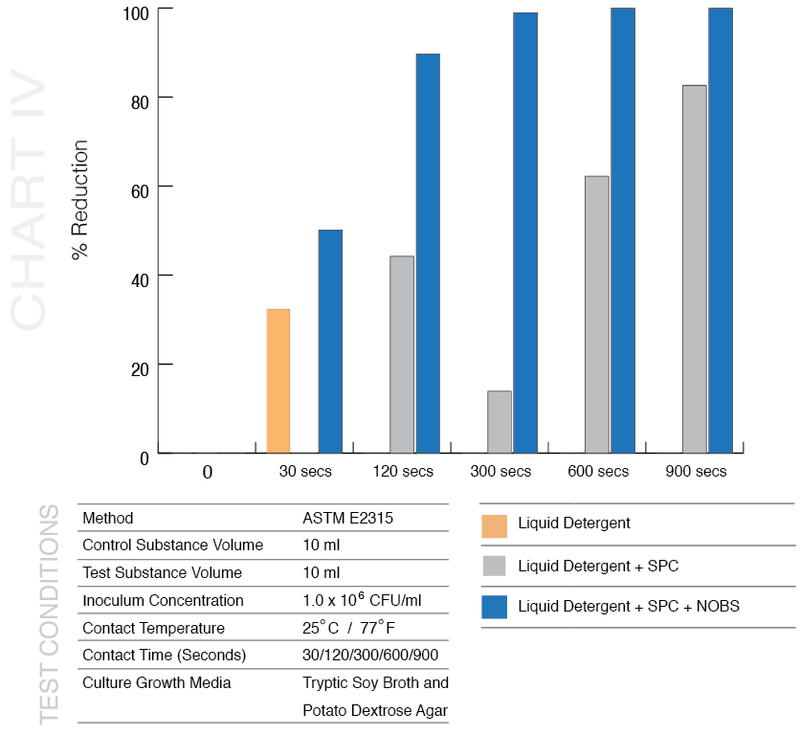 Equivalent or improved performance at a lower concentration provides cost and formulation flexibility for detergent manufacturers. Chart IV. Liquid based detergents typically deploy enzymes derived from genetically modified organisms (GMO) for their cleaning performance. They do not contain an advanced chlorine free bleaching system. In fact, an increase in odor forming residues was observed with liquid detergents. To effectively remove dingy odor residues at low temperatures, use of a liquid detergent in conjunction with NOBS and a peroxide source or use of a powder laundry containing NOBS is highly recommended.